It will focus on solutions — to conservation disasters, micro- and macro-shambles occurring, whether in village, city, valley, wilderness or range — offering not just the small and mostly insufficient actions offered elsewhere, but real solutions to real global problems. There are so many great minds working on these. And in setting out on this course, I found this recent Ted talk by Allan Savory. . . See my blog here for the connections. Allan has an idea — a brilliance based on his life's very important work combating desertification on our range-lands — that will no doubt prove to be an even more important answer to climate change, write global. Just Watch it at the TED website and look for Allan Savory. Across the news the lack of Winter 2012 in the lower 48 states of the USA is finally causing some to question whether this is climate change peeking over the horizon. Unfortunately some are also wondering if it's all that bad. Who can complain about 55 degrees in January where "usually" it's below zero in New Hampshire, or as we've had in the Colorado Rockies, temperatures in the 60s followed by a couple days of freeze? That last year saw some of the heaviest snows ever in these same areas, and this year a scarcity of snow, well how many data points does it take among "major" media outlets to string it all together? But when they do, the note that it "feels great" is just behind the concern. No wonder the US is hand in hand with China and India in remaining the world's largest emitter of green house gases, with "news" like that. The ski areas in Colorado are suffering the weather this year, as commercial activity and the small businesses that rely on the tourism nervously watch the sky and the thermometer, and in January, an offer from ski areas in Montana who have snow will honor certain season passes from dry Vail and Beaver Creek skiers. Economics and weird weather go hand in hand, whether wild storms beget increased costs for clean-up or no storms beget financial disaster for main street, as well as habitats. But of course, there's more than "just" economics and markets, closing shops, lost jobs to worry about with weird weather. On the Front Range, gazing at the blue mountain peaks, causes a native Coloradan to shudder for what is missing when the peaks are blue rather than white with snow in January: Next summer's water in our high desert is missing and unaccounted for. It's quickly noted that the last time snow pack was this low a decade ago, the state's largest forest fire burnt 138,000 acres just south of the Denver metro area. And indeed again in Summer 2012, the residents of the foothills experienced three of the largest fires in state history. California, too, nervously watches whether snow coats the Rockies; lack of winter rain is already raising the d-words —drought among others — in California as a dry January begins. Whether weird weather or climate change, lack of water is a leveler of all playing fields. In the United Kingdom winter 2012, the Guardian noted half of all UK households face water restrictions this coming year if rainfall does not return to normal, thanks to two years of mild winters. In Eastern and Central Europe, drought is causing forecasters to expect decreased grain yields of up to 30%, according to Reuters. And we all have read the drought in the Horn of Africa continues, while in South America, wildfires rage in Chile, drought in Argentina affecting crops, the worst drought in 70 years in northern Mexico, and deadly heavy rains causing mudslides in Colombia, all this week, as reported in the Huffington Post. A year later, in 2013, the UK experienced flooding that brought back memories of an island under water 60 years earlier; the Met records rain levels are 150% of average as it goes into "normal" wet winter weather and a saturated landscape. That's not really a weather forecast any of us could welcome. The next reporting in our Climate Change Gazette will look at how communities have moved quietly into response mode to Climate Change and away from hoping to slow it. _If the world is to stay below 2C of warming, which scientists regard as the limit of safety, then emissions must be held to no more than 450 parts per million (ppm) of carbon dioxide in the atmosphere; the level is currently around 390 ppm. "Today, a great number of Russians are concerned about global climate changes, the shrinking of Arctic ice cover and the fate of the polar bear. And a great number of Russians find it upsetting that a small group of lobbyists, who have personal interests in the management of polar bears in their own way, has been pushing their selfish interests through on the sly." According to the US Fish and Wildlife Service, an estimated 1500 - 2000 polar bears -- or fewer -- range between Alaska and Russia's Chukotka Peninsula. Their natural habitat, the Polar ice cap, is shrinking due to Climate Change. Year-round poaching increased with the collapse of the Soviet Union, with fewer than 300 dens still being occupied, as polar bear skins commanded upwards of $20,000 for a hunter. In an attempt to reduce poaching, a legal "harvest" to be shared bilaterally was set at 58 bears in June 2010. In the US, only the indigenous peoples of the area are allowed to traditionally "harvest" -- with high-powered rifles and speed boats -- polar bears in an exclusion under the Marine Mammal Act. The Russian Academy of Sciences Polar Bear Programme, by comparison, notes that polar bears had been legally protected since Soviet times in 1956. The IUCN, when putting the polar bear on its Red List of Threatened Species, also noted that Russian Chukchi populations should be allowed to traditionally hunt the bear as well. "Considering that the Chukotka hunters ignore all requirements of the law today, guided by a self-given right: 'I have been hunting and will continue to hunt', there are no doubts about what is going to happen if they are legally permitted to hunt. This quota will formally cover the ongoing poaching and make poachers confident that no punishment will follow. They will treat such quotas as a bonus: at last, after 20 years of hunting in violation of the law, their practices have been officially declared legal! Given today's social and economic conditions with such legal nihilism it will be hard to control the number of polar bears actually killed," writes biologist Nikita Ovsyanikov, deputy director for research of the state-run Wrangel Island Nature Reserve, a member of the group of polar bear experts at the International Union for the Conservation of Nature (IUCN). "Today, a great number of Russians are concerned about global climate changes, the shrinking of Arctic ice cover and the fate of the polar bear. And a great number of Russians find it upsetting that a small group of lobbyists, who have personal interests in the management of polar bears in their own way, has been pushing their selfish interests through on the sly. If we lose polar bears in the Russian Arctic, people should know why this happened and who is responsible! Still, we have a chance to avoid this scenario." In a November 2011 report by Environment Canada, Canadians would be willing to spend about $6.3 billion (or willingly pay $508 additional taxes/household) to "ensure polar bears do not disappear." The report was noted by the Canadian charity Bearsmart. Courtesy of Nasa's Earth Observatory: http://earthobservatory.nasa.gov/NaturalHazards/view.php?id=76390 Subscribe to it! It's great! 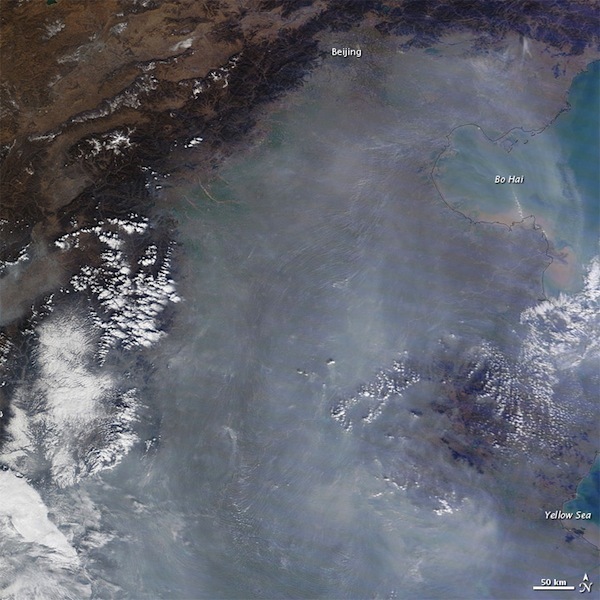 From Nasa (Above): "Thick haze blanketed eastern China in early November 2011. The Moderate Resolution Imaging Spectroradiometer (MODIS) on NASA’s Terra satellite captured this natural-color image on November 10. The haze extends southward from Beijing along the coastal plain bordering Bo Hai and the Yellow Sea. According to a World Bank study, only 1 percent of China's 560 million city dwellers breathe air considered safe by European Union standards. Xienhuanet's English language service in June reported that more than half of China's cities are affected by acid rain (due to air pollution), while it noted that "About 40 percent of major rivers are so polluted that the water can only be used for industrial purposes or landscaping. About 16 percent of the total is unfit for agricultural irrigation." In its newest 5-year plan, China's government says it plans to focus on the environmental damage due to its rapid growth. China "has gotten to be the industrial dumping ground for the world," notes Orville Schell, Asia Society's Director of the Center on US-China Relations. "We complain in America about losing jobs, but we've exported all our dirty industries to China. They're bearing more of the environmental cost than their rightful share. But the paradox of course, is that when it comes to climate change, it doesn't matter where they are. We all pay the consequences." —E.D. If Earth has warmed and cooled throughout history, what makes scientists think that humans are causing global warming now? Response by Nasa's Rebecca Lindsey of Nasa on Nov 10, 2010. "The first piece of evidence that the warming over the past few decades isn’t part of a natural cycle is how fast the change is happening. The biggest temperature swings our planet has experienced in the past million years are the ice ages. Based on a combination of paleoclimate data and models, scientists estimate that when ice ages have ended in the past, it has taken about 5,000 years for the planet to warm between 4 and 7 degrees Celsius. The warming of the past century—0.7 degrees Celsius—is roughly eight times faster than the ice-age-recovery warming on average. The second reason that scientists think the current warming is not from natural influences is that, over the past century, scientists from all over the world have been collecting data on natural factors that influence climate—things like changes in the Sun’s brightness, major volcanic eruptions, and cycles such as El Niño and the Pacific Decadal Oscillation. These observations have failed to show any long-term changes that could fully account for the recent, rapid warming of Earth’s temperature . . . "
If you've landed here by chance, please also visit my home page!